you have mention "R.layout.ln_dialog" but here there is no such layout. can you please provide details for this layout. also "R.id.webkitWebView1" is not present. it is giving error. also provide details where to place this view. I have Update the blog with complete source code and url. Also now I added the git Repository link for download the code also. I just Update the blog with complete source code with git repositry link , please check now. Have you changed the LINKEDIN_CONSUMER_KEY and SECRET KEY??? because this is giving you a communication error. Yes I changed. In the debug mode the error raise in the following lines. Hello Vimal, I have test the above git repo code and its working fine.Please cross check once again the way you are creating the key.Or you can drop your code...so that I will check and fixed it. I download your sample but unfortunately got some errors. When I click login button app is closing. Maybe you can help me ? application crashes when hitting the "Login" button. 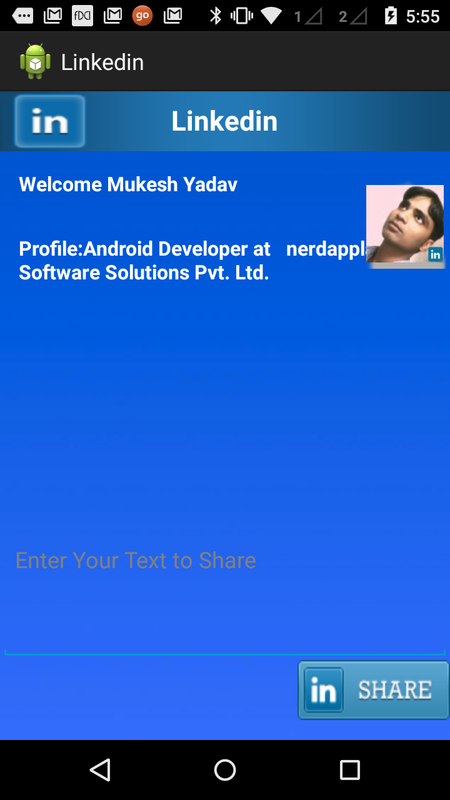 i am implementing linkedin integration in my android app. com.google.code.linkedinapi.client.LinkedInApiClientException: Access to posting network updates denied. I am looking to POST using API's in Java. Can you help me with a sample . I think you didn't change the secret key and consumer key.....please those key with the valid one. I have tested the code and its working at my end. Please let me know if you still facing same error. @Mukesh , same error as Ayesha tariq is getting. please check. please tell me is there any change we have to made in these parameters..
No there is no need to change these values. Hello Mukesh, if i try to gt any info other than user Name it crashes. please can you go through this issue. Hi Mukesh. Can you tell me what version of the linkedin-j library you included in your code on github? Thanks. Hi. Could you tell me what version of the linkedin-j library you have in your github download? It doesn't appear to match any available on Google Code. the project fails bcoz of "android.os.NetworkOnMainThreadException"
Hello Friends, I just Updated the code as It was crashing on sharing message on Linkedin. As it shows error "LinkedInApiClientException: Access to posting network updates denied." Now, It will be Fixed. I have updated the Linkedin-j-android lib and also edited few lines in the code. Now Its working perfectly. Thanks all, who drop me the message and mail regarding this issue. hello mukesh, where is your updated code which you are saying in above comment. Please post your latest code. Check the updated code here..
Can you please tell me the reason. I have modified the config file correctly. Will u please send me your code. How you guys are trying. Bcoz, I am running the above code at my end and its not giving me any error. Do I need to do special things for Java build path? 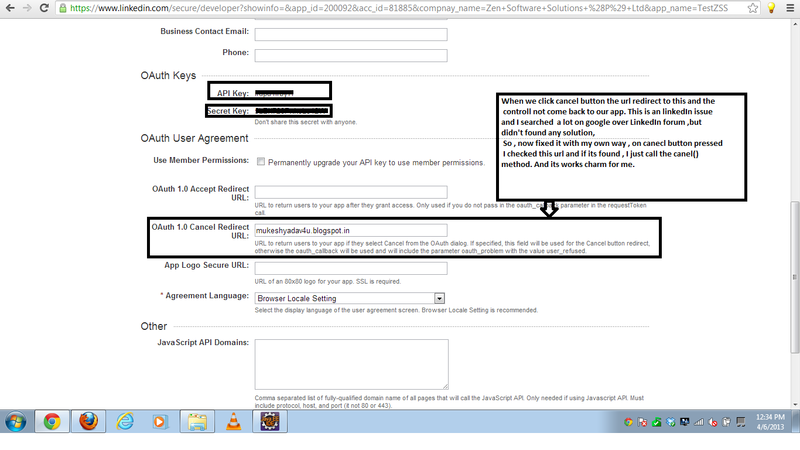 I used API Key and Secret Key not OAuth User Token and OAuth User Secret, Am I correct? hey mukesh your code is stop on belove code.. This can be fixed by placing LinkedinDialog.oAuthService.getOAuthRequestToken() in a AsyncTask. How can we place the LinkedinDialog.oAuthService.getOAuthRequestToken() in an AsyncTask? Please call the linkedInLogin() method in AsyncTask. Currently it running on main thread. an error is thrown oin the catch block and it says unable to get verifier. After providing the login details, I am again redirected to the login page instead of the welcome screen. Where am i going wrong? Please provide me the log cat error. Hello Mukesh, I was also getting OAuthServiceException but resolved it by placing the code in AsyncTask. Now I am getting LinkedInApiClientException on the line client.getProfileForCurrentUser(). Kindly let me know reason for the exception and possible solution for the same. Thanks in advance. I have download the code from the above link. "E/StrictMode(622): A resource was acquired at attached stack trace but never released. See java.io.Closeable for information on avoiding resource leaks. Can you please suggest me for this? 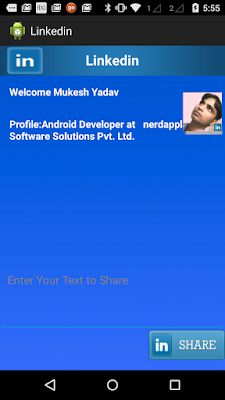 I am trying to integrate linkedin with android application. After giving the login credentials, access token getting null due to below exception. If I will change my code with async task, It will work or not ?? @Mukesh yadav or anyone help me.. When you place the code inside AsyncTask it will work. Now working fine, successfully logged in. But NetworkOnMainThread exception. I have an idea to resolve this. I need to put share method also within async task. Am I right ? Yes , use asyn task for sharing message on LinkedIn. Actually this NetworkOnMainThread issue is because of "StrictMode.ThreadPolicy". Use asyn task for sharing too. I have moved my share method code to Async task and run the application. Toast showed "Shared successfully". But there is no status update in my linkedin profile. Here whats happening ? Is there any callback method for share functionality ? Because we dont know whether the shared text will reach the profile or not ? Or else is there any other way to share the text ? Issue 2 : you code is working below 4.0 only. Can you make it update for all android version. Issue 2 : in current when i am sending post it display toast" Share successfully" but there is nothing post in My Linked Account. it is really good for us if you correct it and update soon. I am checking the code...the message sharing parts is working fine at my end. Now fixing for higher version support. Thanks For your immediately reply. HI mukesh . your code running fine , no error is there but when I am posting any comment it is not showing my linkedIn account. 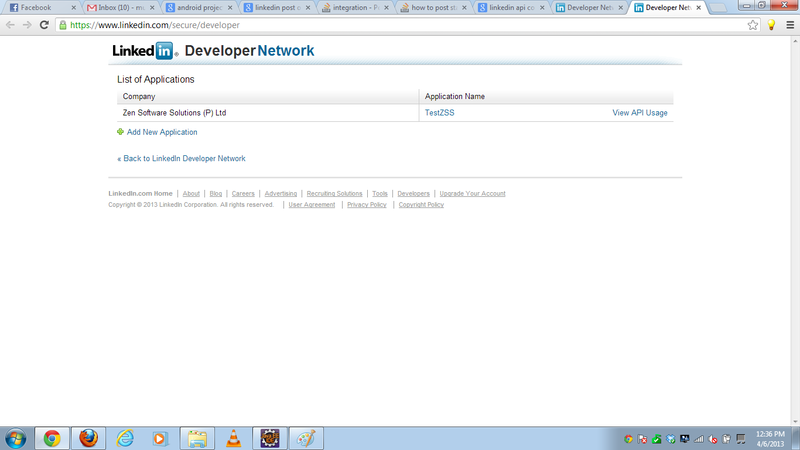 Next I am going to get the information from Linkedin profile using People API. There is a java method available in linkedin API document. I want to use that method to get response. But in our project, that classes not supported. That classes not available in our application. What can I do ? Refer this link http://developer.linkedin.com/documents/reading-data. I did the quick fix for LinkedIn message sharing . made several changes in threre Api. repo. Please check the latest code. Wall post issue is now solved in this code. just only higher version issue is there. Please look on this so you can get idea for solution of error. i have resolved this error, Now it work superb. there is a mismatch parameter in scopeParams. here we have we have to set same parameter which is done check mark while creating application. Again,Thank you very much for helping and share this post. This application based on oAuth 1.0 or oAuth 2.0 ? which one you used ? Is there any way to logout this application ? Can you give me the code how to get LinkedIn connections List. This code is working fine for me. . .
How to share images on linkedin wall ? Is there any way to get email id in this application ? Thanks a lot for this post. It is very useful for me. Can you please help me out to find linked in friend list ? This example is working nice but i want to get user connections list. thanks for tutorial mukesh but how to fetch user email id? I am trying to fetch industry, country,dob ect. I fixed and updated the code on github. Also added some new feature in it.like user profile picturemnumber and more. 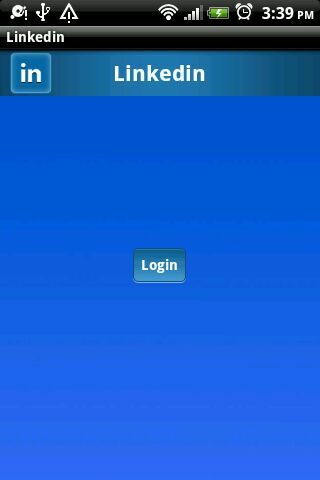 I run this app on device successfully. 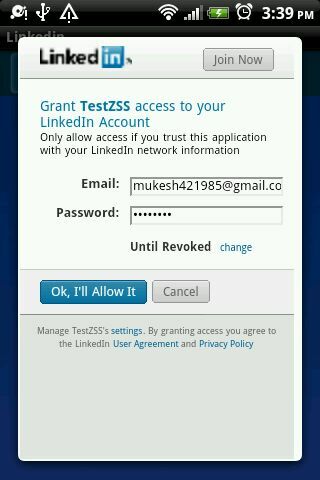 Also got authentication(oauth)successfully.but when is send message from this app to linked IN.and then check it on my linked IN account there is no post(msg) is displayed. how to check message send from app is posted on account or no not? I have tried appending scope to oAuth service params but using that, I am facing issue at Login click , "com.google.code.linkedinapi.client.oauth.LinkedInOAuthServiceException: oauth.signpost.exception.OAuthCommunicationException: Communication with the service provider failed: https://api.linkedin.com/uas/oauth/requestToken?scope=rw_nus+r_basicprofile"
It would be really helpful if you could tell where the problem is. I can now login in my app using linkedin. Can you please tell me how I can log out from linkedin. plzzzz reply as soon as possible????? Hlo Mukesh plzz tell me how to give permissions to retrieve user data like email and in your Config.java String scopeParams is not using then how permissions Like r_basicprofile work???? HELLO Mukesh ,M not able to get date of birth and its showing null even I given the authority to Everyone to see my birthDate.......One thing more tell me how to give r_Fullprofile permission in your code ans I checked your Config.java,in this string scopeParams not using why?? ?plzzz reply as soon as possible ..
Hi Mukesh the code that you provided is not working correctly for me. I am not able to verify it by the code that is generated in it...Please help me. hi mukesh , how can i get email address. please help me. Hi,Mukesh how can i get the email address.please help me. Hello Mukesh do you have code to sync the calendar with sqlite database?